I am so bad at peeling squash that most of the time I will buy it peeled and diced... But I can work on the melted butter, maple syrup, and cinnamon mix over it! Squarrrsh!!! Mmmmm this is my fav veggie. and yes I make lots of sweet slime too. and with the leftovers I make butternut gnocchi. your comment on my blog: I love to deep fry my kitten tenders on one day then serve them up for the rest of the week. I am so stressed for time these days. Yum. I love butternut squash. Slather it in butter and syrup, sure, why not. Sounds delicious. We've never been big squash eaters in my house, but you sure make this look tempting! I'm sure my son would love it considering it's covered in sweet slime! Grace, sometimes it's the simpler things in life that taste so good. You have just posted one of those things. Bravo! Adding cinnamon is a great idea! I love squash with maple syrup. Dude I have a squarsh on my counter and I am adding chopped pecans! Great idea! Absolutely perfect, Grace. Maple syrup and cinnamon are just right to team up with squash. My grandmother used to dump maple syrup in acorn squash and bake it. Delish! But I think roasting brings out more flavor and cinnamon would add a little touch of spice. Will try this one next week. Major Yummy! I LOVE butternut squash and this simple dish is just perfect... no other food needed- I can make a meal out of this maple and cinnamon adorned squash! awesome shot! Love everything about this! Posthaste. Who says that? That's why I love you. I declare to use that word at least five times in normal conversation today (my five-year old won't know what I'm talking about). And I also declare to make this squash. Yum. I love roasted butternut squash, olive oil salt and pepper, roasted until it caramelizes, yum. Maple syrup and cinnamon would make it... dessert, double yum. This sounds absolutely divine. 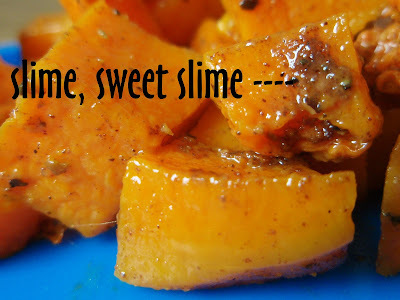 I bet it would be great with Thanksgiving dinner, instead of my normal candied yams! All those things sound like they'd be perfect with butternut squash! Mmmmm mmmmm. I'll bet this would work on the pumpkins I am trying to eat up, too. Thank you! That is a very good thing to do to squash! Sounds very scrumtrulicious. Sweet slime is good. Very good. That is southern for sure! Oh yum! My mom used to roast squash and cover it with brown sugar for us when we were growing up ... a delicious food memory I need to recreate. Love visiting you Grace, I always learn a new word. I shall attempt to use "scrumtrulescence" in a sentence today (if I work out how to pronounce it). I use my super strong vege peeler on squash - too scared my knife will slip. Hehe squarsh. It certainly is a workout getting those suckers ready to cook, but so worth it! Yum and thanks for the prepping demo. I love squash but haven't tried it prepared sweetly yet, I'll definitely have to do so soon because it sounds awesome with all that butter and maple syrup! You should make butternut squash pancakes! Mmm. Do it do it do it do it. Perfect. I love butternut squash and of course I expect yours to have cinnamon. Another stellar recipe coming from you, Grace! This would be perfect to try on the family this Fall. Wish me luck. Squash with maple syrup is too sweet for me,.. Syrup, cinnamon, butter, brown sugar and chopped walnuts make butternut squash soooo perfect! I'm so glad that I grew up enough to love squarsh...cuz I wasn't born that way. This looks soo good....gotta love the slime. Pour on the slime!! I adore butternut squash! I wonder if you could mash the squash and add it to the pancake mixture, I might try that!! PS.I think you are as mad on cinnamon, as I am on chillies! Yum! The squash is rather abundant right now so this recipe will come in handy! Nope I would rather have this deliciuos looking squash you have made over pancakes! I have been a squash hound as of late. This was also a lesson in the pronunciation of many words, HA! All sounds delish Miss Grace. I can't get enough fall squash! Love this! I'll bet I can even get my kids and husband to eat this! They generally steer clear of "weird" vegetables (for example, anything that is not corn or broccoli), but this might just win them over! Real spiderwebs are not cute, but icing ones are quite tasty! I have one on the counter right now taunting me. This would be a good way to use it! Oh yes, that would have to taste wonderful! One of the best things about fall is squash in all its glorious variety. Plus with squash you can roast the seeds for snacks! Nicely done and love it! that sounds so good! I just roasted some delicata and wish that I had used something sweet... it was missing an essential flavor, and I think that's it! My Mother used to take acorn squash put a pat of butter in one half, a heaping tablespoon of brown sugar, a pinch of salt and then roast them in the oven. Oh I loved them. I am a friend from Taiwan is very pleased to find your blog, I also very much like your site content and articles, in addition I have added to my favorites, is there the honor and opportunity to invite you to my site to your blog then? I offer my website name and URL, also hope to regularly visit and exchange of information Oh! , thank you!